I'm quite proud to announce the latest in the portfolio of web-sites - RICH BUCKLER! Rich approached me a few months ago and asked that I create a site devoted to his comic book artwork with details of how to arrange a commission directly via Rich, so there it all is. There's links to interviews, loads of colour images and paintings, vintage original art, recent cover recreations and much more. There'll be a few exclusive items going up as time goes by, so pop over to http://www.bucklercomicart.com/and check it out. Potted Review: U2 + YouTube = U2ube! Like a few million people worldwide I clicked onto YouTube recently to catch the Rose Bowl concert as it was broadcast live. 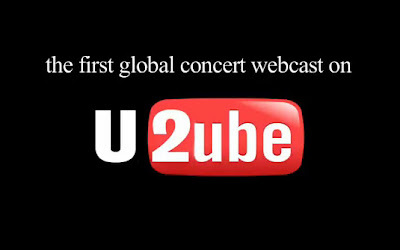 If you missed it you can catch the entire concert here. So, how was it? I have mixed feelings about U2. I've always said that one of the most impressive concerts I've ever seen was the 1993 ZooTV show at Football Park. The entire experience was overpowering in scope, it was both sonically and visually staggering and nothing I've seen since has come close, certainly nothing from U2. I've always felt that they shouldn't keep trying to top it, but rather they'd be better served going back to their basics and just getting out and playing.